I’ve built up quite the collection of stuff over the two decades I’ve been a serious gamer. No more so than most people who have taken up a hobby for that period of time, I’m sure, but the difference is that, like a particularly compulsive magpie, I usually can’t stand to get rid of any of it. This is why I still have an ancient CRT television, amongst other things; it’s old enough to have SCART and aerial inputs and so still works with my array of old consoles. Unfortunately the amount of stuff I owned had comfortably outstripped the amount of storage space available for some years, and so I decided to trek back to the family home over the latter half of the week and have a long overdue clearout of the more obsolete items in the collection. When it comes to consoles, though, nothing is truly obsolete. As long as the machine turns on and you can find something that’ll display the image both they and the games that run on them will run perfectly, even if they’re decades old. I ummed and aahed over my Playstation and N64, wondering whether it was really worth keeping them around when I haven’t played them in probably seven or eight years, but ultimately the utility argument won out: they still work, and there’s some part of me recoils at getting rid of things that are still in full working order. 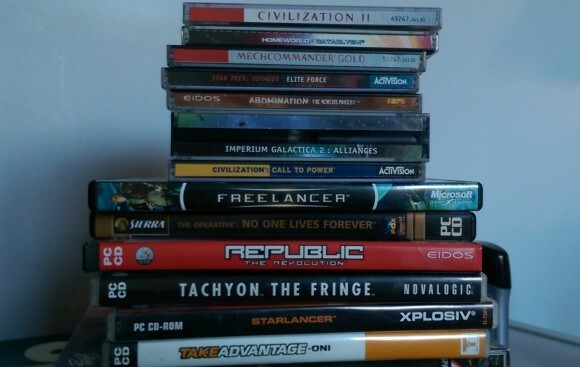 The same cannot be said of my PC game collection, however. Now, this might have gone differently if I still owned a significant number of the ‘90s-style big box PC games. If nothing else those things usually came with hefty manuals, and I really really like hefty manuals. Sadly a temporary loss of sanity about ten years back meant that while I still have most of the manuals I no longer have the boxes, and so most of the collection consists of CD jewel cases and the newer style of DVD box2. These I have no problem whatsoever getting rid of if there’s a good reason. Games that once worked, but which I now knew to be completely incompatible with modern systems. The Thief games are good examples of this; I think the GOG rereleases have been touched up so that they work, but the disc copies I owned were utterly useless. Games that didn’t even work when I bought them. I have no idea why the hell Evolva refused to boot on a perfectly good Windows XP system, but it did. Guess it had some bad code that made it particularly susceptible to the gradual entropy that claims all physical copies of PC games. That I was still hanging onto it despite this is a good sign of how just how hoard-y I’d become. Games that I’ve since acquired through digital distribution. 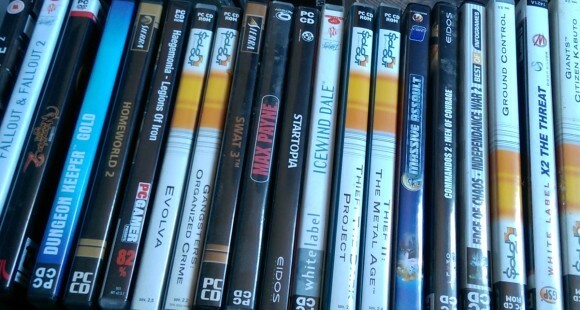 This turned out to be a surprisingly long list; it’s not like I’ve gone out of my way to rebuy things that I already own, but there’s a lot to be said for the convenience of a service like GOG, especially since GOG copies have a significantly higher chance of actually running on a modern machine. Nearly every single copy of a PC game bought post-2010, which is roughly the point where Steam/Origin integration became standard. I used to labour under the constraints of capped internet, which meant it was always useful to cut down on bandwidth usage by buying a copy of a Steam game on physical media. (Also physical copies were — and often still are — cheaper.) Now, of course, that physical media is totally redundant. I ended up getting rid of roughly half the collection for the above reasons – a good 40-50 titles. When you compare that to the number of Playstation, N64, Xbox and Gamecube games I spiked (zero, zero, zero and zero respectively) it’s a particularly telling sign of both PC gaming’s biggest weakness and its biggest strength. The PC is unique amongst gaming formats. The average lifetime of a console generation is around 5-7 years. The average lifetime of a gaming PC is far shorter; even a machine that is bought while it is at the cutting edge of technology will start to seriously struggle with new releases within a half-decade. On the flipside PCs are flexible enough to upgrade, and unless you’re doing a big component like the graphics card the upgrades are even reasonably priced, which leads to a culture of incremental improvements to a gaming machine that ends up being a smooshed-together combination of the old and the new. My GTX 970 shares the same case as the 500GB hard drive I bought eight years ago and which I now use for bulk storage; the case itself is the same ATX-standard one I bought all the way back in 2003. Since a partial upgrade is comparatively cheap it’s extremely rare that I purchase a whole new machine3, and even then the old machines tend not to stick around for too long, instead inevitably being scavenged for parts to augment or fix PCs belonging to friends and family. Long story short, I still have all of the consoles I’ve bought over the last two decades but I have none of the PCs, and because the technology used to run PC games isn’t trapped in amber like it is for the consoles this gradual upgrade process can also be viewed as an encroaching erosion of the bedrock on which older games stand. The PC is a living, evolving platform, which means that sooner or later I’m going to replace something — usually the OS, but it can also be something as fundamental as a media format since these days a lot of new PCs don’t even bother with the optical media drive, preferring to do everything via USB and the internet — that causes one or more of my precious collection of games to become extinct. And once that happens, well, that version of the game pretty much gone for good barring the ruinous expense of recreating an old system exactly as it was at the time of the game’s release. No other format has this problem – and while it’s lessened over the years thanks to increasingly standardised programming libraries I don’t think it’s going to go away. Steam will still be around in fifteen years barring some horrifying financial catastrophe for Valve, but I strongly suspect that many of the new games it’s selling now will have trouble running on whatever the PC has evolved into by then. Still, if this is an issue that’s caused by the sheer flexibility of the PC platform, it’s that very flexibility that allows for a solution. For example, DOSbox has been around for so long now that we take it a little for granted; the first few versions were a little rocky, but it quickly became the best way to play all of those old DOS games even when you were using a copy of Windows that still had access to the old MS-DOS prompt, since it circumvented all of the awful DOS hardware configuration that people prefer not to remember4. It’d be literally impossible to play any DOS-based game without it as DOS hasn’t been part of the Windows architecture for decades now — that’s a category that includes nearly every single PC game coded before 1995, and quite a few that were released afterwards. 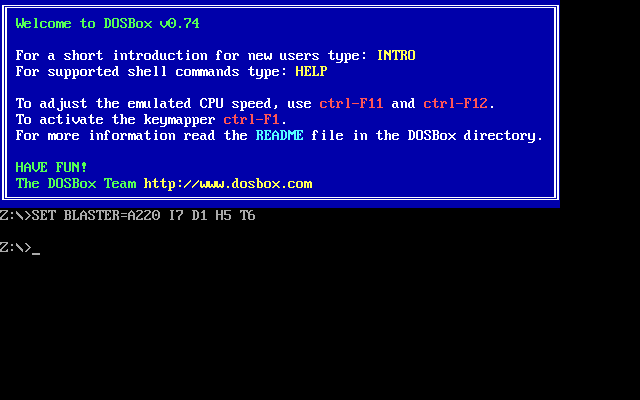 DOSbox does a lot of heavy lifting, and is so convenient that it’s been baked into every digital rerelease of those games on GOG and Steam. They go to the trouble of resolving all those gnarly licensing issues preventing the sale of the game and (usually) provide updated copies of games that have a much higher chance of actually running on a modern system. A lot of the time this just involves packaging it inside a DOSBox wrapper, as above, but recently they’ve started to do rereleases of early Windows-era games that historically have been extremely awkward customers as far as making them play nice with Windows 7 / 8 is concerned. That latter initiative enables – and is enabled by – the existence of studios like Night Dive who specialise in resurrecting hitherto dead PC games. DOSbox is fantastic for everything pre-1995, but for a lot of games released into the no-man’s land of Windows 95 the only way to make a working copy is to get somebody like Night Dive involved. 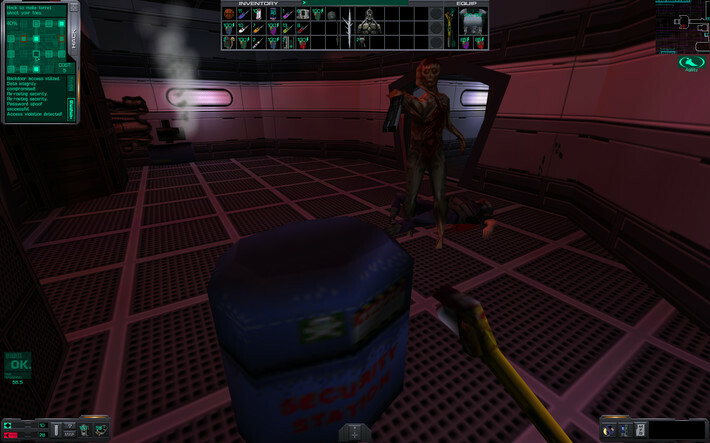 It’s a non-trivial piece of work to port something like System Shock 2, and not something you’d do if you weren’t sure of a market in which you could sell the resulting product. GOG provide that market. So you can forget their noble anti-DRM stance and their gradual attempts to metamorphose into a serious competitor to Steam5; for my money by far the most valuable service GOG provides is that they simply exist as a place in which increasingly-large swathes of PC gaming history are being preserved. Without them we’d still be stuck in the morally-grey world of abandonware and homebrewed hacks – and as somebody who experienced that world first-hand, I can confidently say that GOG’s service is so much better. As good as GOG is, though, it still has some way to go. Just as interesting as the games I got rid of during my cull were the games I elected to keep. A good number of these were because of personal sentiment6, but there was a sizeable subset that were saved from the purge for one simple reason: while the code may or may not run on a modern system, they still represented the only possible legal way I was going to be able to play the game in question for the foreseeable future. There are sizeable holes in GOG’s catalogue, and they crop up in some rather unexpected places. For example, I can take a pretty good guess as to why, while you can totally buy Call to Power 2 from GOG if you’re in the mood to experience one of 2000’s more mediocre titles, Call to Power 1 is nowhere to be seen on the site7, but I was very surprised to learn that you can’t buy Civilization II on there either. (Or the original Civilization, for that matter.) Another conspicuous omission is Freelancer, which received lukewarm reviews at the time of its release but which has become a well-regarded cult classic in the interim. Like Freelancer, I also happen to think there are several games in that pile that, while they might not have done too well at the time, would be pretty well-regarded if they were to experience a rerelease on GOG today. 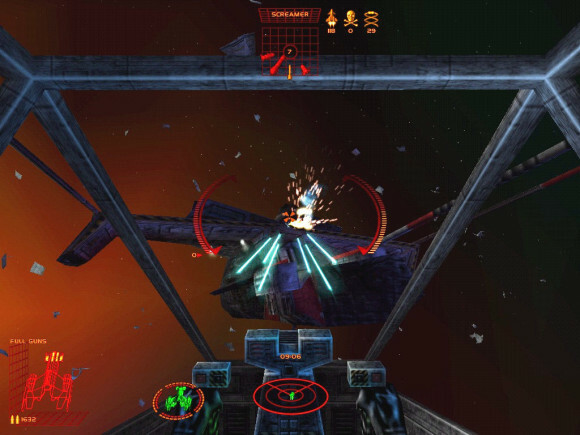 Bruce Campbell-fronted Tachyon was otherwise decidedly mediocre no matter which way you look at it, but I think Starlancer would be well-received if people were to come to it in 2015, when the space sim is experiencing a long-overdue resurgence, rather than sinking without trace about six months after the genre suffered a sudden and tragic heart attack with the release of Freespace 2. Abomination was a good, if deeply flawed game, but it too had the misfortune to be released into a period when its putative audience had temporarily lost interest in the XCOM mix of tactical squad strategy and strategic base building. I’ve written about my love for Mechcommander before, and it was even released as freeware several years ago so it’s not like it’s totally unavailable, but you have to jump through several hoops to get it up and running on Windows 7 (god knows what I’ll have to do on Windows 10) and it’d be nice to have a version I can run without the hassle. So GOG’s service, while good, is more than a little uneven in places. I’m sure that if a big game doesn’t exist on GOG it’s hardly because GOG doesn’t want it there (they’re not allergic to money, after all) and it’s more likely to be because of some arcane licensing issue that the current copyright holder can’t or won’t resolve. The flexibility of the PC platform means that code incompatibility can usually be resolved if you invest enough time and effort, but no amount of reasoning will shift a publisher’s legal department if they don’t want to budge, and it’s this that’s now the biggest blocker towards having complete libraries of functioning software online. It even occasionally claims games that have already cleared that hurdle; the older Fallout titles were withdrawn from sale on GOG a year or two back after their licensing ran out. It’s not the end of the world where those particular games are concerned as they’re still available on Steam, but it’s a disturbing occurrence that indicates GOG’s solution might not be an altogether permanent one. Indeed, I don’t know if there *is* a permanent solution; that point I made about Steam’s games being incompatible in fifteen years’ time is also true for anything GOG sells now, and even for DOSBox (if it ever stops being updated, that is). If there’s one immutable law of the universe it’s that entropy always wins, and so while GOG is successfully holding back that tide for now they won’t be able to do it forever. If nothing else, though, being able to get rid of so many of my older games with a clear conscience has given me a new appreciation for just how good things are at the moment when it comes to experiencing previously-lost moments in PC gaming history. I’m going to enjoy it while I can. The Internet Archive is also doing something to combat the loss of PC gaming history (albeit for other software such as AOL CDs as well). While something like https://archive.org/details/softwarelibrary_msdos_games might seem useless at a first glance, it’s a great way to keep software that would otherwise be forgotten. Great article. I too am a gamer of a certain vintage and remember fondly taking train trips to visit my parents in London from Glasgow with a rucksack full of boxed Pc games that I wanted to trade/sell in CEX. I inevitably would return with an even heavier rucksack of new boxed games with lovely manuals. Thank god for GOG now my knees ain’t what they used to be. I still have loads of old microprose and EA boxed games left though. Nostalgia is a warm feeling. Complete agree about the faffing around trying to get these games to run on modern puters. Any one remember using Memm extender programmes to get games to run? Young folk today. Don’t know they’re born. IRQ and DMA. What a time. Good article – thanks for the trip! 1.) Hah, the only TV we have is a CRT (though it’s not ancient, a 2006 Thomson, it has color and everything…), and I even plugged in a Chromecast for kicks. 2.) I’m keeping digital backups of my CD/DVD/Steam games on my storage hard drive. I experienced firsthand what it is to be in a situation where your Internet connection is not stable/fast enough for Steam to work (Steam is *much* more capricious in that regard than other download services), and you never know when you might end up in that situation again (or if Steam has issues on their side). And well, keeping backups of everything digital you even slightly care about is just good policy (and as you said, optical drives tend to disappear these days – though you can always buy an external drive). 4.) 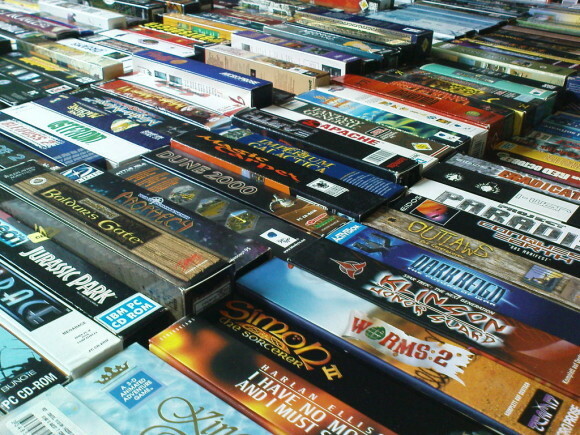 Yeah, the real issue is the early Windows games, especially 3D ones (Will we have the same issue in 20 years with early “Tiles” software made for “Windows”RT?). The only games I have trouble running in Windows 7 are Dungeon Keeper 2 (which is so bugged, even after GoG did their pass over it, that depending on which features you want to break less, you have to use 3 mutually exclusive patches) and Space Empires 5 (a 2006 game, but which is seemingly reliant on an old DirectX standard that Vista and later Windows ended up emulating, which is greatly slowing down the game when nested screens are involved). And since they’re 3D, emulating them or running them in a virtual machine isn’t a viable option (so far?). Oh, and there’s also the funny situation of Microprose’s (Sid Meier’s) Magic The Gathering (1997? ), which has a terrific community which greatly expanded the game – http://www.slightlymagic.net, but which, while being a 32-bit game, still uses a 16-bit installer – that doesn’t work on 64-bit Windows! But then, so far it’s just about convenience of running everything on the same system – it’s not too hard, after all to dual-boot Windows 98 or XP on a old hard drive (though I wonder if it’s still going to be possible to do that once UEFI is generalized). Also, it would seem that Windows 8 Pro and even more Windows 10 come with some new virtualization options, so in some cases running older games might become *easier*. But as evidenced by the removal of LAN play from Dawn of War 1 and Homeworld 1, it would seem that the companies aren’t willing to invest that effort. I just hope that as GoG took a hard stance on game DRM, they will also take a hard stance on refusing games that have multiplayer but don’t allow direct IP connection. Part A – reverting copyright terms to a saner duration (the original “14 years after release” seems to be also economically better, if some economists are to be believed), not to mention that, as you said, software get obsolete faster than other works of art. Part B – require (commercial-only?) software to leave their source code in government’s safekeeping until then. WINE for Linux is a pretty decent solution for the no-man’s-land of early Windows games. This reminds me of the fact that the majority of films from the silent era have been lost to time, I wonder if people 80 years from now will look back at the video games of the turn of the 21st century in the same way. On the other hand digital media is still a bit easier to preserve than analog, maybe someday someone will design some sort of special software that will be able to emulate any sort of past OS and every old PC game will be preserved forever, who knows.